US Airways is well-known for selling miles at a discount. 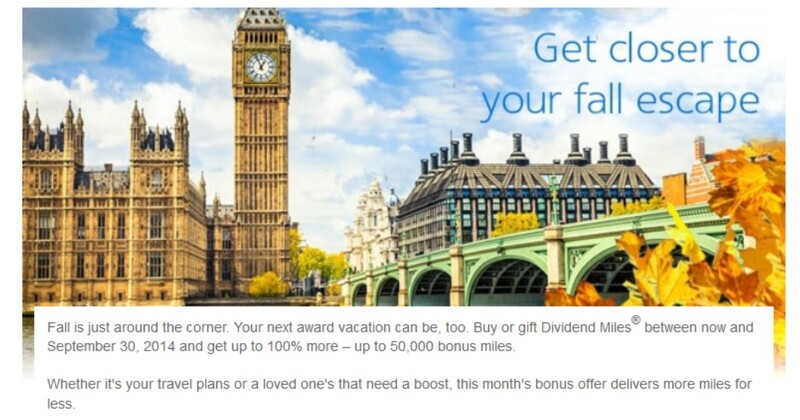 Now through September 30, 2014 they’re offering a tiered bonus when purchasing Dividend Miles. This can be a great way to top off your account if you’re just a little short of an award. Or if you want a business class ticket, you can buy 50,000 miles with a bonus of another 50,000 and, voila, you’ve got enough for that ticket. Just be sure that you can’t otherwise get the business class seat for less than the $1750 + tax price for those 100K miles! To get the bonus, go to the US Airways website and click on the Buy Miles link. From there you’ll be prompted to log into your US Airways Dividend Miles account.